When considering when to upgrade to Microsoft Office 2010 on your client machine(s), there are many considerations, one of those being the level of compatibility of between the Office Suite and SharePoint Server 2010 and/or SharePoint Server 2007. As it stands, Microsoft Office 2010 Standard Edition lacks many key compatibility features with SharePoint Server, while the Editions such as Office Professional and Office Professional Plus offer much more (Microsoft, 2010). One of the most important usability features of compatibility is the ability to manage information inside SharePoint lists and libraries is datasheet view. I know that once this feature is adopted by a user base, it is not something that can be taken away because people rely on on datasheet to manipulate data fast and easy. Regardless of whether Office 2010 is 64-bit 0r 32-bit, the edition of office must be ABOVE STANDARD. 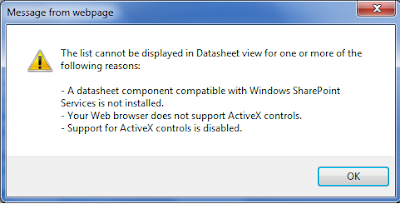 This means that if you have Office 2010 Standard, you DO NOT have datasheet view. I cannot imagine having a SharePoint environment in which I do not have access to datasheet view, and so I would base my decision on which Office Suite to use solely on datasheet view...in other words, Office 2010 Standard is dead to me and I only care about Professional and higher from this point forward. Error: "The list cannot be displayed in Datasheet view for one or more of the following reasons:..."
A. Download and install the 2007 Office System Driver for Data Connectivity Components. B. Install the 2007 SharePoint Services Support, which is available on the Microsoft Office 2007 installation media. Microsoft (2010). 2007 Office System Driver: Data Connectivity Components. Retrieved June 28, 2010 from http://www.microsoft.com/downloads/details.aspx?familyid=7554F536-8C28-4598-9B72-EF94E038C891&displaylang=en. Microsoft (2010). 64-bit editions of Office 2010. Retrieved June 28, 2010 from http://technet.microsoft.com/en-us/library/ee681792.aspx. Microsoft (2010). Compare server integration features between Office suites available through volume licensing. Retrieved June 28, 2010 from http://office.microsoft.com/en-us/buy/compare-server-integration-features-between-office-suites-available-through-volume-licensing-FX101850719.aspx. Microsoft (2010). Compatibility Between the 32-bit and 64-bit Versions of Office 2010. Retrieved June 28, 2010 from http://msdn.microsoft.com/en-us/library/ee691831(office.14).aspx. Marvelous - worked exactly as needed!